Her name is Zowee and she sits in front of my studio silently guarding its door. She is a black panther, and a very handsome one. Alert, yet calm, she can scare you quite a bit. Not to worry though — she is not going to harm anyone. She is a large statue, a new mascot for my studio. I first saw her as one of the items in a silent art auction. The auction was part of a terrific “Evening of Music, Dinner, and Giving” — a benefit for the Owl & Panther Project. I enjoyed the entire evening, but my mind was occupied by that black panther. The minute I saw her, I wanted to have her and was very determined to win the bid. And so I did. I am so glad to have Zowee, because I am an enthusiast and supporter of the Owl & Panther Project. Zowee’s presence reminds me and connects me emotionally to that project and to its gentle philosophy. There is also another reason I am happy to have her. Lately I have longed for an inspiration for my creative writing. Zowee fits that need perfectly; after all she is the creature that helped quite a few to guide themselves out of the darkness. 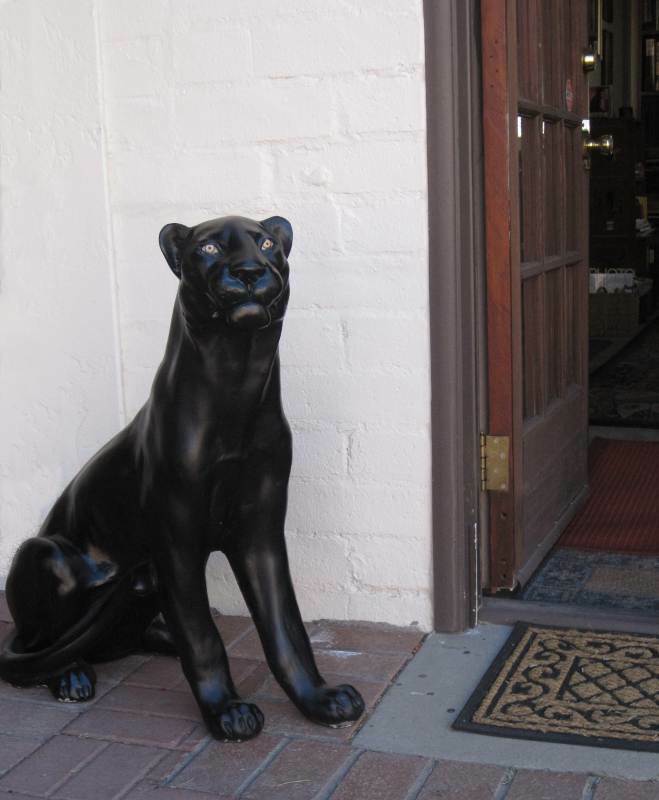 What does a panther have to do with writing? There is a Cherokee creation story that ties strongly to the Owl & Panther Project and to its philosophy. Below is the beginning of the story. “I am sure we will be rewarded if we do not sleep!” said Zebra. “We can do this,” Cat agreed. The second night found some of the plants and animals drooping. “This is harder than I thought,” exclaimed Penguin. The next night almost all of them (animals and plants) fell asleep. When the seventh night ended, it was just the owl, the panther, and a few plants who were still awake. “I will reward you two animals with the super power to see in the dark,” said Creator. That is why the owl and panther can guide all kinds of creatures (including humans, of course) through the darkest times. 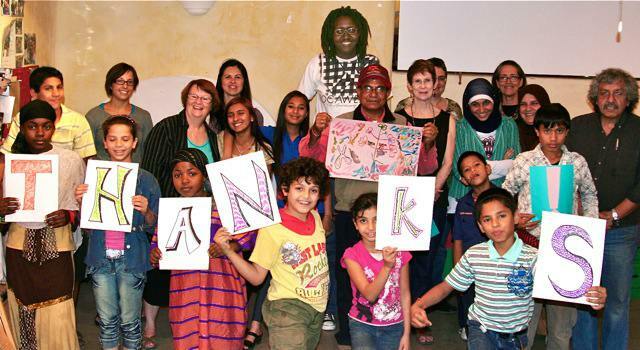 The Owl & Panther Project is an outreach program based in Tucson that serves refugees who arrived in the United States from many distant countries. Its focus is working with children and young adults to help them cope with their past traumatic experiences and help them adjust to living in a very different culture. Creative writing is the major tool of expression. As the motto of the Owl & Panther logo says, “Writing out of the darkness.” Young participants write and perform their poetry, share their personal stories, and gain confidence through that process. They are also learning that they are not alone — that others who have experienced tragedy, violence, and losses have learned to overcome their fears. The project is funded by several cultural organizations and private contributors, but in today’s economic reality needs more support than ever. It is guided and sponsored by the Hopi Foundation. The Hopi word for trauma, ’tsawana’, means “a state of mind that is in terror.” Like the owl and the panther we must learn the power of being able to see in the terrifying darkness and to strive towards a state of Qa Tutsa wanavu — a state of living unintimidated by fear from any source — as I learned from one of the Hopi leaders speaking that evening. This Hopi belief is the philosophy of the Owl & Panther Project, its participants, and many dedicated volunteers. I might not know about the Owl & Panther Project if not for Marge Pellegrino, its Program Coordinator. Both being writers, we met in a writing group a few years ago. Still, I would have no clue about her dedication and passion for that group if I hadn’t gone to a large event presented by the Owl & Panther project at the Loft Cinema in May of 2009. The event was unforgettable! The cinema was packed to the brim. The presentation of the young people’s stories on the large screen and the opportunity to meet them in person touched me deeply. Since then I have tried to participate in the group’s events as often as possible. That is why David and I attended this year’s benefit on the 12th of February. It was our Valentine’s celebration, as the entire event was associated with Valentine’s Day. 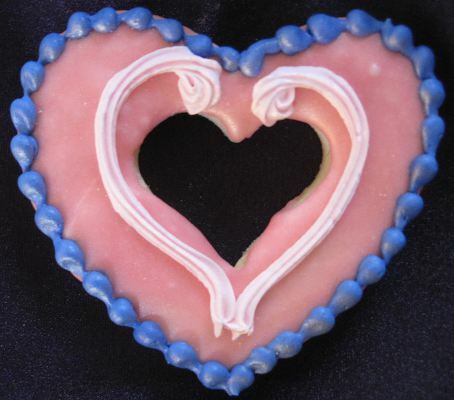 We all received large hand-decorated heart cookies. Here is my cookie. It’s too pretty to eat! Together with Zowee it reminds me of the Owl & Panther group and of the Hopi Foundation — their philosophy, their work, and their huge caring heart for others who need a lot of loving. Darkness and overwhelming difficulties are not so frightening when you know that there are groups like this in our world. P.S. Please remember my gift offer for new subscribers at the end of my previous post. Logo and photograph of the group – copyright © by the Owl & Panther Project. Text and other photos copyright © 2011 by Alicja Mann.